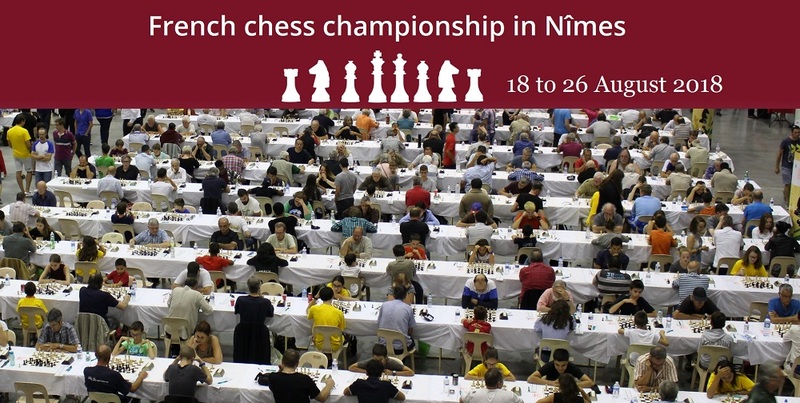 The French chess championship will be held in Nîmes from 18 August to 26 August 2018. Nearly 1000 players from all over France are expected, with the prestigious title of French champion at stake. In fact, there are nine tournaments that will be played, each player participating in the tournament that corresponds to his level and play nine games. The best players participate in the National tournament and in the National women’s tournament, which award the titles of French champion. The 2017 French champion Étienne Bacrot will try to win his 9th title, and the Sophie Milliet could obtain a seventh title which would be a record. Many animations will be organized in the city, in particular the « Chess night » organized Thursday, August 23rd, and during which it will be possible to play free against the champions of chess in the city center. Initiation stands will be deployed to introduce chess to the inhabitants, who will be invited to join the « French Championship of beginners », open to all. 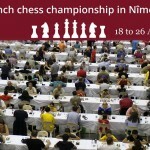 The French chess championship is organized by the Nîmes chess club and the French Chess Federation (FFE), with the support of Nîmes métropole, the Occitanie region and the Gard department, in partnership with Europe Échecs, Diagonale TV and Nature et Découvertes. This is the biggest tournament of the year organized by the FFE. About 3,000 people will make the trip, taking into account families and accompanying persons. The venue is Le Parnasse, 160 Avenue du Languedoc, 30000 Nîmes.